If you’ve been in any public space, a new trend is clearly becoming very prevalent in the adult population: using e-cigarettes. They are probably less harmful than tobacco smoking, but they come with various side effects. In a study more than half of the participants reported some side effects which they attributed to e-cigarette use. The most common were dry mouth and throat which contributed to 38%. Many e-cigarettes use a liquid substance that is produced into a vapor that is inhaled. These liquids contain Propylene and Glycerol. The dry mouth may be associated with the water-absorbing properties of propylene glycol and glycerol. 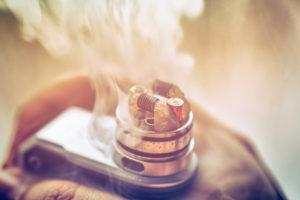 Those who use e-cigarettes often form the habit of using them even more often than cigarettes, just because they are convenient, which in turn exacerbates the dry mouth problem. If you do use e-cigarettes, it’s important to remain hydrated at all times. Drink more water than you normally do, and eat water-based foods like fruits and vegetables. Sometimes even this doesn’t work, and that’s where we come in. Try Lubricity today for dry mouth relief that contains only 5 simple ingredients and lasts up to four hours!